The Mindful Teen offers a unique program based in mindfulness-based stress reduction (MBSR) and mindfulness-based cognitive therapy (MBCT) to help you deal with stress. The simple, practical, and easy-to-remember tips in this book can be used every day to help you handle any difficult situation more effectively-whether it's taking a test at school, having a disagreement with your parents, or a problem you are having with friends. "Despite the explosion of mindfulness literature in recent years, there are remarkably few high-quality mindfulness resources written specifically for adolescent populations. This gem of a book from Dzung Vo will go a long way in closing that gap. More than a series of techniques and exercises, The Mindful Teen provides the crucial contextual information necessary to answer the most important question teens have about mindfulness practice--Why should I care about this?" --Chris McKenna, program director at Mindful Schools, http: //www.mindfulschools.org "The Mindful Teen is a beautifully written book that walks the line between making mindfulness easy and accessible to teens who may or may not be inclined to delve deeply into the topic and providing real substance and depth to a powerful practice and way of living. Full of understandable, doable practices, super relevant examples, and quotes, this book doesn't talk down to kids, but speaks up to future adults who deeply desire to overcome the challenges they face and not only succeed, but thrive. A valuable guide to living the practice of mindfulness that anyone could benefit from reading." --Steven D. Hickman, PsyD, founder and executive director of the University of California, San Diego Center for Mindfulness, and associate clinical professor at the UC San Diego School of Medicine "Dzung Vo has crafted an invaluable resource for teens everywhere. Inspiring teen voices, along with practical applications, make The Mindful Teen incredibly relevant and accessible. This heartfelt offering to the world is a must-have for teens, the parents of teens, and anyone who works with adolescents." --Meena Srinivasan, author of Teach, Breathe, Learn "A generous gift for the next generation. Dzung Vo offers adolescents a gentle path through a turbulent time, with skills they can use for the rest of their lives." --Christopher Willard, PsyD, Cambridge Health Alliance/Harvard Medical School, author of Child's Mind and Mindfulness for Teen Anxiety "Dr. Vo provides intelligent and compassionate guidance toward mindfulness--a tool that can bring balance back into the increasingly imbalanced world of today's youth. As a psychiatrist, educator, and parent, I have been witness to the awesome effects of mindfulness firsthand. This book will change lives!" --Shimi Kang, MD, psychiatrist and author of the national bestseller, The Dolphin Way "If you are a teenager who wants to live a less stressful, more enjoyable life, I encourage you to read The Mindful Teen. This book offers powerful mindfulness exercises in a clear, simple, friendly, easy-to-use format. Start reading and experience the benefits, now." --Amy Saltzman, MD, author of A Still Quiet Place "What teenager hasn't felt stressed, anxious, angry, or just plain unsettled? 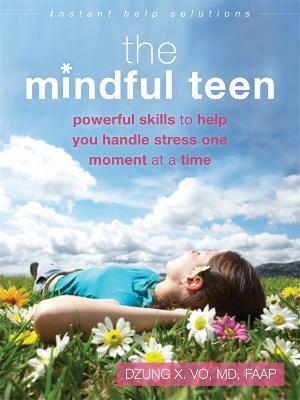 The Mindful Teen offers straightforward, understanding guidance for teens. Be yourself, find yourself, and create for yourself a lifelong ability to more easily manage the ups and downs of everyday life." --Mark Bertin, MD, developmental pediatrician and author of Mindful Parenting for ADHD "This book can change your life, not because of anything it will convince you to do or believe, but because it offers you the tools to access your own wisdom, to calm yourself, and to find sensible solutions to the challenges you will face." --Kenneth R. Ginsburg, MD, author of Building Resilience in Children and Teens "This clear, simple book is not just for teens! Everyone can benefit from its profound, practical wisdom. I will recommend this to all the teens in my practice." --Kathi Kemper, MD, MPH, director of the Ohio State University Center for Integrative Health and Wellness, and author of Mental Health, Naturally "Dzung Vo, my student, is a very dedicated and wonderful adolescent pediatrician. He has written this book as a record of experiences working with adolescents. It is a recommended book on mindfulness for teens and a teaching tool for the Wake Up Movement. I highly recommend this book for teens and teen educators." --Thich Nhat Hanh, Zen Master, poet, scholar, activist, and author of Being Peace "A book that establishes a truly wise, empathic, and motivating resonance with teens. It offers a straightforward and commonsensical way to deal with stress of all kinds and afflictive emotions and thoughts by inviting them into awareness and discovering that with a little mindfulness and heartfulness, you are much much bigger than they are!" Dzung X. Vo, MD, is a pediatrician specializing in adolescent medicine at British Columbia Children's Hospital, and a clinical assistant professor of pediatrics at the University of British Columbia Faculty of Medicine, in Vancouver, Canada. His medical practice, teaching, and research emphasize promoting resilience in young people to help them thrive in the face of complex stress and adversity. He has helped to develop and teach mindfulness-training programs for youth with chronic stress, chronic pain, depression, and anxiety.